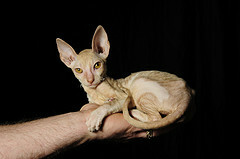 The CFA accepts the Cornish Rex cat for show in every imaginable color, including colorpoints, lavender, chocolate and white, in addition to all of the basic colors. Cornish Rex cats have a short, fine textured coat which many people believe to be hypoallergenic because of the belief that these cats don’t shed. This is not actually true. Of course, by comparison to some other cats, the Rex’s shedding is very minimal. A bit of petting along with regular brushing using a very soft brush is all that is needed. This breed is distinguished by it’s velvety soft coat, which falls in rippling close curled waves, very short and lying flat to the skin. In addition to this characteristic, the Rex has a very distinct head and body type. Large pointed ears are set high on a small, egg-shaped head with high cheekbones a high-bridged nose and a firm chin. These are muscular cats, thin, but graceful with big, round bright eyes. 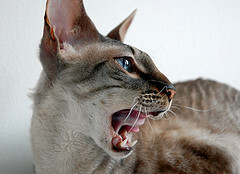 The very people loving Cornish Rex is also extremely active, affectionate and inventive in its play. They are inquisitive cats whose kitten-like attitude stays all throughout their lives. Good with all kinds of home situations, this cat is a joy to be around. Cute and cuddly, the Cornish Rex is known for its soft, wavy curls and sweet personality. This native of Cornwall, England, savors the little luxuries in life. Enjoying the comforts of home and warmth, it is well suited for apartment or condo life. Anyone who appreciates a happy, jolly personality will love this active and agile feline. Copyright 2010 Raven Fabal, "The Cat Lady"